The OH-28 (large) & OH-29 (small) guitar supports are designed to replace the traditional footstool, allowing guitarists to sit more comfortably and in proper balance, while playing. The supports assist players in maintaining good posture while seated, reducing the muscle stress and fatigue and allowing more freedom of movement. The OH-28 & OH-29 rest on your thigh rather than attach to your guitar, so there is no way for the supports to damage the finish of your guitar. The large support raises the height of the guitar by approximately 5.5″. The small support raises the height of the guitar by about 4″. The correct size is determined by your body size and the height of your foot rest. In general, taller people would use the larger rest. Players who keep their foot rest in a lower position would use the smaller support. 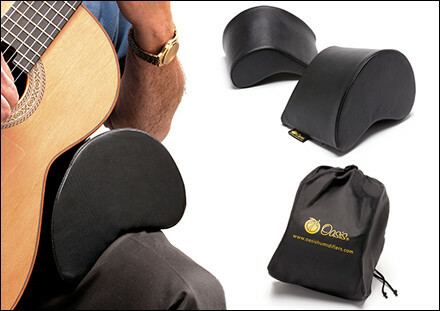 Purchase a Guitar Support today for only $24.95 – includes free shipping.